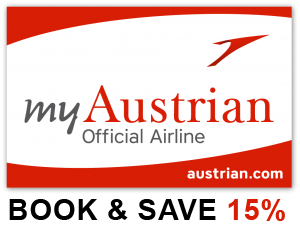 Book your flights to the "UMAP 2019" online at www.austrian.com and SAVE 15% on all applicable fares! Use the Larnaca public bus Route 425 (view the map and the route) which passes by Lordos Beach Hotel-Venue and all the other accommodation hotels. Alternatively, you can use one of the public bus route 417/418/419 to get to Larnaca City Centre (Central Bus Station) and afterwards hop on another bus to reach your accommodation hotel. Please visit 'Zinonas Buses' webpage at www.zinonasbuses.com for routes, timetables and maps for all buses in Larnaca.